The Croatian National Bank have issued (1st July) two new coins which mark the country’s accession into the European Union, as of the 1st July 2013 – Croatia becomes the 28th member state. From constituent republic of the former socialist republic of Yugoslavia, Croatia emerged as an independent democratic republic after the dissolution of Yugoslavia in 1991 – the second time in its history that Croatia had become an independent country. Negotiations began in 2004 for Croatia’s eventual entry into the European Union and it wasn’t until December 2012 when the agreement between the governance of the European commission and that of Croatia was finally signed paving the way for today’s 28th member to join the 56 year old organization. The two new coins, one gold and one silver, are designed by the sculptor Damir Mataušić and feature simple designs of the now familiar stars symbols of the EU. A pattern reminiscent of a honeycomb is made of 27 stars, the former number of EU states and highlights the last and 28th star, that for Croatia, includes a smaller incused five-pointed star. 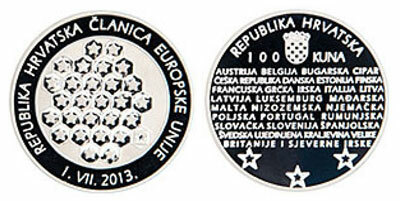 Also included are the names of the current member states on the silver coin’s reverse. The gold coin’s obverse design includes a depiction of three stars, highlighting the three steps to accession, that of negotiation – agreement – accession. The text “REPUBLIKA HRVATSKA ČLANICA EUROPSKE UNIJE 1. VII. 2013” is included on both coins on the obverse. The two coins are denominated in the national currency, the Kuna, which was introduced in 1992 after the re-establishment of the National Bank. Produced by the Croatian Mint on behalf of the National Bank, are struck to proof quality. For more information on these and other coins offered by the Croatian National Bank, please visit their website at: http://www.hnb.hr/novcan/hnovcan.htm Information is offered in both English and Croatian, no information regarding the sale of the coins to overseas address is given. Coins are available as a two coin set or individually and from outlets in Croatia as directed by the National Bank of Croatia. Why the Kuna denomination? Shouldn’t they be in Euros now? No, not at all, although Croatia have joined the European Union, they are several years away from joining the Euro-zone, but before that occurs, the Kuna must be set with a permanent exchange rate which is a first step to the adoption of the Euro. Latvia and their Central Bank will adopt the Euro from the 1st January 2014 and Andorra have been given the right to issue Euro denominated coins from their own Monetary authority, also commencing on the 1st January.